We just learned about the work of art A Bar at the Folies-Bergère by Édouard Manet. Another famous work of art is the wall mural in Bethlehem painted by artist Banksy in 2005. Some artists use their skills to send a message about things they want to say to the world. The artist Banksy has gone out to public places and painted things on walls of buildings or by streets so that people can see paintings that may change the way they think about the world. 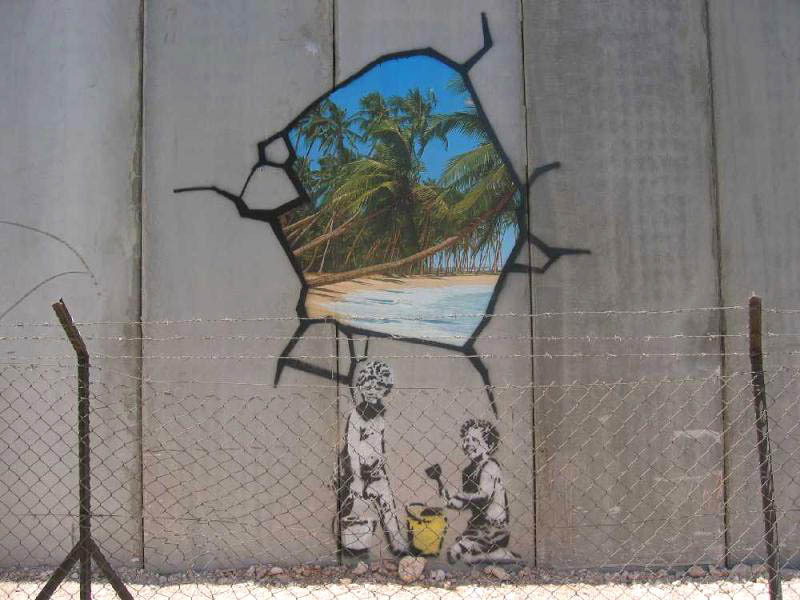 In the Banksy mural in Bethlehem there are some children by a crack in the wall with a sunny beach on the other side. Many of the paintings that Banksy makes are on buildings where it is against the law to spray paint things. Spray painting pictures on someone else's property is called graffiti. Since Graffiti is illegal, Banksy has to work in secret to keep from getting arreested. At this time no one even knows who Banksy really is. People don't even know if Banksy is a man or a woman, or if Banksy is even a bunch of people working together! Whoever it is, they are very famous and they are using their art to send messages about how they feel about the world.